How do firms become Client-centric? 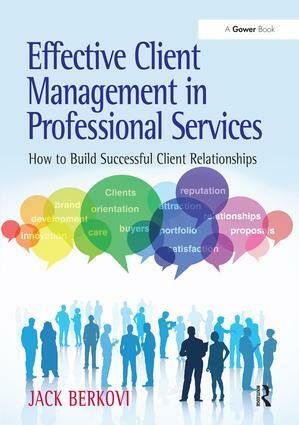 Effective Client Management in Professional Services is about putting the Client first, everywhere, in the activities of professional services firms. The book introduces The Client Management Model to enable firms to assess their level of Client orientation and relationship development. It also features The Client Management Index which enables firms to benchmark their result against their peers. Many firms are still developing and improving their commercial structures and approaches to attract, develop and retain Clients. Characteristically, professional services firms tend to lag their consumer goods and service industry counterparts in overall commerciality. Only recently have they discovered the value of having a strong brand promise with the associated employee engagement. In many firms achievement of Client satisfaction is not a strategic objective; this may need to be reviewed. This book provides a comprehensive, pragmatic guide to the Client relationship journey, from identifying potential Clients to their engagement, care, retention, development, loyalty and beyond. The handbook format has exercises and tools which can help to establish which Clients are likely to be the most lucrative and thus provide the desired financial returns. The book also includes insights from top practitioners, anecdotes, case studies, charts and useful exercises and checklists. Readers can also determine their own level of effectiveness using the end of chapter reviews and a diagnostic tool to produce a Client Management Profile. Jack Berkovi is an international marketing and business development specialist with most recent experience in professional services. After management and marketing roles with Procter & Gamble, 3M and Norton Company, in 1988 he moved into consultancy at Marketing Improvements Group. As Operations Director, he worked with Clients in Australia, Europe and USA including: Balfour Beatty, Foseco, Henkel, HP, Jones Lang LaSalle, PricewaterhouseCoopers, Savills, Strutt & Parker. MIG joined Robson Rhodes in 1999 where Jack became Head of Marketing for their technology, media and telecommunications sector; then managed their corporate campaigns and business development. When Robson Rhodes merged with Grant Thornton UK, Jack was appointed Senior Manager, Corporate Campaigns, then Head of Brand and Client Care. During his stewardship, the level of Client satisfaction and unprompted brand recognition both increased.